I was rather proud of myself for getting to Merafa so efficiently, cheaply and pleasantly. Now the plan was to continue this triumphal march and get to Lamu the same day. LP, the omniscient bible, claimed that it is impossible to get back from Merafa to Malindi on the same day, but I was desperate to prove them wrong. It was still before noon when I finished sightseeing in Merafa. Feeling rather grateful for such a good tour, I suggested that George, my Merfa guide, hops on the boda-boda with me and my driver and we get a coca-cola baridi sana (very cold coke) ‘in town’ before I attempt, against LP’s wisdom, to find a transport to Lamu the same day. To my surprise and joy, two more matatus where waiting in the town square – empty but without doubt being primed for the road. We sat down in the shade, drunk the cokes and discussed the nutritional value of locusts and grubs (which I think he understood as ‘crabs’). We waited twenty minutes. It seemed like it’s going to be a fairly long wait before either of the matatus goes so I did not object when George suggested that we go a little further from the square where a respectable Mama sells lovely palm wine. I’ve never had palm wine ‘straight’. In Gorontalo, Indonesia, I had the pleasure of drinking it mixed with Guinness – as that’s the disgusting local custom – with the town chief of the Muslim abstinence committee. But pure and freshly fermented: never. George maintained that the matatu is not going to go for a while and besides we are going to see it as it passes. Thus assured, I proceeded to sit myself down under a pleasant canopied seating area built especially for the purpose of enjoying the palm wine in the company of your friends. Unfortunately, it turned out that the delivery girls have not yet returned from the groves with the new load, so all we could get was the palm wine of yesterday, which is slightly sourer. We acquiesced nevertheless. The Mama made a rather big show of washing the ‘cup’ and straw for me and then ladled carefully the milky white juice out of a huge jar. George went first, demonstrating how to sip through the wooden straw, which had a ball of fluff on its end to sieve out the impurities. I drank cautiously. Palm wine, or pemba na mnazi, is an acquired taste. The first cup I finished reluctantly, the second one somehow went down easier. The properties of this drink must truly be of the relaxing kind, as I did not even raise much of a fuss when I saw my matatu drive away into the distance. I did scold George a little but hakuna matata, and after all, there was still another matatu in the town square. I would have proceeded to it immediately, was it not for the fact that at this instant the skies opened and it hammered down with torrential rain. There was really no point getting wet on the off chance that the other matatu will be leaving so soon so we stayed for another shared cup. When the skies cleared half an hour later we went back to the square. George must have felt rather bad for making me miss the matatu and made sure I got a lovely spot in the next one which left just half an hour later. I was still quite sure I will make it to Lamu despite this delay of 1.5 hours. The plan was to get of on the barabara Malindi-Garsen and try to catch a matatu there. After the rains, parts of the road turned into a slimy morass which the matatu driver quite skilfully negotiated so we reached the main road in good time to catch the last matatu towards Lamu, or so I thought. The driver however did not think this such a good plan and insisted that I go with them all the way back to Malindi (some 30mins south) and only then take a bus or matatu back north to Lamu. In hindsight, going south when you need to go north and back and forth on the same road does not make much sense, but at the time and under the influence of the pemba it somehow seemed reasonable. I got back to the matatu and went back to Malindi. In this way, I wasted a further hour only to find out that there are no more buses going to Lamu that day. At that point I should have probably stayed in Malindi for the night. After all, it was well after 2pm and I had not much chance of getting to Lamu before sunset. But I was obstinate – I blame it on the pemba. I enquired about other possibilities and was informed that there still should be a bus going to Garsen, and I could hop off at the junction 70km before Lamu and try to find transport there. That I did. Buses and matatus in Africa go not on schedule but when they are full. The best you can hope for is that they fill up quickly or the driver himself gets bored with the waiting. Some matatus fill half-way and hope to pick passengers on the way, which they do with the help of the conductor who half sits-half hangs out of the bus, yells the destination to passer-bys and bangs on the roof of the matatu if he wants him to stop. Another trick is to find the right bus, as they exhibit destination plates next to never. Yet, I have to admit, so far I have not once been misdirected to a matatu, the other drivers always honestly pointed me in the right direction, rather than trying to get me on their bus which sometimes happens in other countries. It took over 1.5 hours to fill that particular matatu: waiting in the blistering sun would have been a torture if it wasn’t for the friendly merchants who brought me an old oil barrel and put in the shade of their canopy. This delay left me with not much chance of reaching Lamu, or even the junction before nightfall. It was twenty minutes to sunset when we reached Garsen junction. The bus driver was urging me to stay on the bus as he reckoned the chances of getting any transport at this hour were slim. This time I decided not to listen and got off on a nearly deserted junction. Next to a few closed market stalls and a broken down truck a few men were milling. 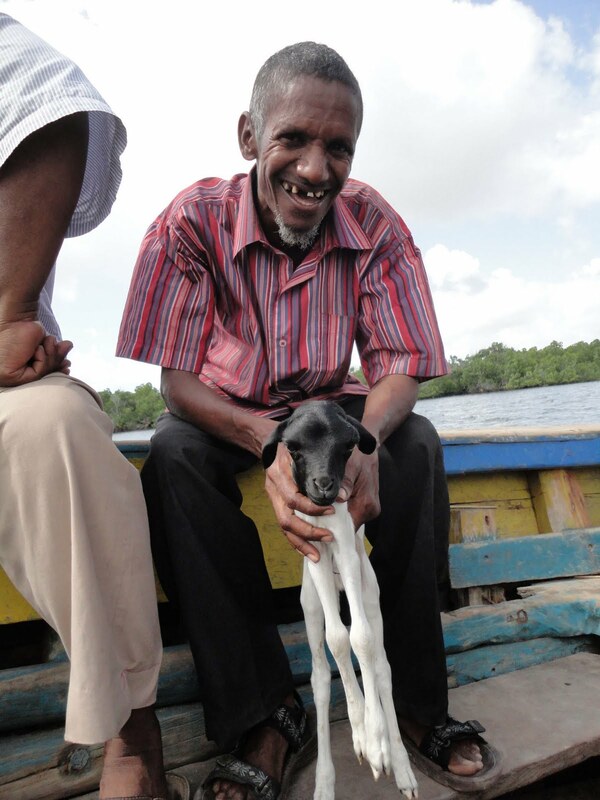 I approached them and asked about the possibility of getting to Lamu. They shook their heads, said the chances are slim but I could try my lack by the rather grim looking sign-post. Inshallah, a truck carrying soldiers manning the roadblocks might still come. I waited for ten minutes, my hopes sinking as fast as the setting sun. I was already pondering if I should pitch my tent in the village or deep in the bush, when a pick up truck appeared on the end of the road. Allah akbar! The men who were waiting with me jumped up and hailed it, pointing at me. Is he going to take me, or not? And should I really get in if they do? I did not have to ponder these questions for long, as the driver nodded his head, my rucksack was taken from me, thrown onto the pick up and I was ushered into the cab. My companions turned out to be contractors from Mombasa on their way to the US military base next to Lamu. Khalid and Saddam, for these were their names, turned out to be a very pleasant and informative company. Khalid, the bigger of the two men, spoke very good English and was happy to talk about everything I wanted to know about Kenya. We talked and practiced corruption: it is not allowed to use the Lamu road at night and we had to buy our way out of police checks, first by way of sweet baobab seeds which I’d offered to the soldiers and other times with the help of a few shillings. Unfortunately, Khalid informed me that there are no boats to Lamu after sunset and they will be stopping in a Mpeketoni village, some 30kms from Lamu, for the night. Mpeketoni is a little off the main road but it is the only place on that stretch that has electricity and any decent accommodation. I would have probably preferred to have tried to find a boat in the port anyway, but I had no choice but to agree to the detour and delay. Despite the hassle free and friendly ride, I was still a little uneasy to accept the offer of spending the night in the company of strangers in the middle of nowhere. Khalid must have noticed my consternation for he hastened to add that I’d get a nice single room, we’d go out and eat, all expenses on them, and we’d set off early the next day. I am their guest and I should not worry about a thing. I tried not to. 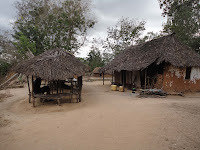 And so we arrived in Mpeketoni, a town founded by Jomo Kenyatta who settled his triebemen Kikuyu there to grow crops and feed the barren port of Lamu. It’s a dump of a few blocks, no paved streets and a hotel, which, given the circumstances, was actually quite nice. 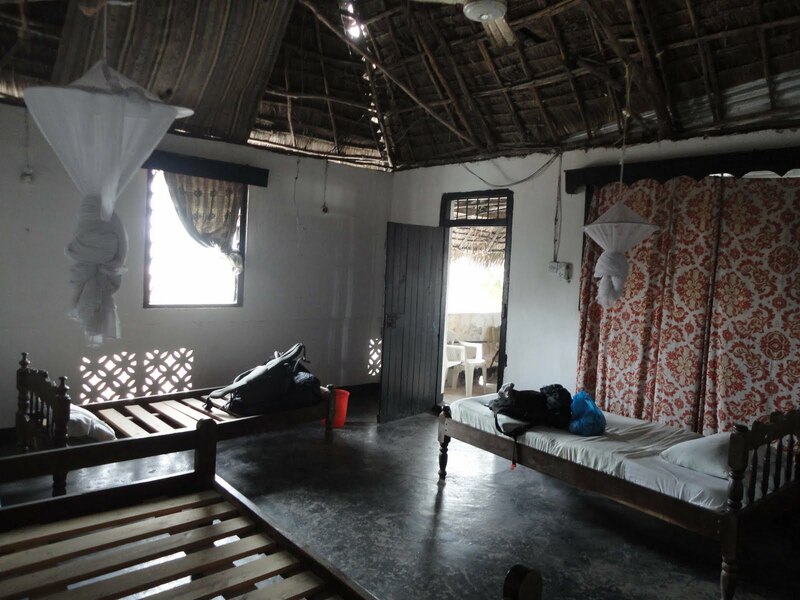 It was my first night in a bed, and a huge four-poster with mosquito net at that. It all felt a little unreal: the day had been long and certainly did not go according to the plan. 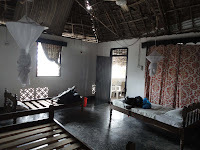 But I was almost at Lamu, with head full of images, impressions, and information. I could not expect to have reached that far without a bit of palm-wine induced stubbornness and recklessness but, above all, without the friendliness and helpfulness of the Swahili Coast Kenyans. Hakuna matata. Many thanks to Khalid, Saddam, George and all helpful matatu drivers, passengers and bystanders. p.s. The pics feature the lovely palm wine drinking spot, as well as a little goat I was given to hold and caress on the boat to Lamu the next day. The owner, pictured, wanted to sell it to me for as little as 100Ksh and, given how sweetly it slept on my lap the entire way, I was awfully tempted to buy!